“Dá Tempo” is a mobile/multiplayer online game, where players can’t see each others screen, therefore they must work together to solve puzzles, by speaking to each other. It was a very short deadline to implement a online system so that the players could be able to do that, but fortunally and also thanks to GooglePlayGames plugin for Unity, I was able to develop the game and it worked great with our testers, which by the way was Elderly gamers (60+ years old). The Scarecrow Prince is a co-op 3D game for 2 players. Based on the movie “Howl’s Moving Castle”, the trans-media game’s highlight its the numerous references to the animation of Studio Ghibli. In this game we aim for a new challenge, to take all the references and iconics characters from Studio Ghibli’s film at the same time that we design a incredibly adventure. BUG is a action platform 2D game where the player controls a robot created to destroy things, but a bug in his program changes his computer mind to good. And now, afraid of the others robots, he needs to get out from the factory where they all were created. The player will face other robots besides the obstacles from the factory, such as fire, fake grounds, pistons that may crush anything bellow, all this to take BUG, name adopted by the robot himself, out of that scary place. For that objective the player will use Bug’s skills, like jump or turn to sphere to pass trough the obstacles and use his plasma gun to destroy enemies. Some items will be hidden in the stage that may help Bug in his journey. The Tourist AUSCHWITZ is a adventure / exploration / educational game with stealth elements. The main Objective is to revive all the historical contents during the gameplay. Now a days Young people don’t get used to absorv this kind of knowledge. Leaving the classic scope of educational games for behind, The Tourist is based on the history of The World War 2, more specifically in the concentration field Auschwitz II – Birkenau, through the main character drama. The game art direction plays a role extremely important and converge with the main subject in several aspects in order to the player can feel the scenario and its secrets. 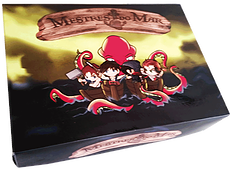 Masters of the Sea is a Fantasy-Strategy Boardgame that has an uniques battle and movement mechanics which makes every play different. The game was made by a seven-people team in a period of 4 months, and it was originally done for a college project which granted the highest score of the class. Project Share Stories, it’s a App for people to share their stories with friends and other people around them. I have been working on my free time, and still very much an early prototype but I think it’s is getting pretty good.